This CD is a collection of Godzilla related vocal tracks from a variety of sources. Most songs will sound familiar and are by the original artists. Others I am not sure of. The CD is certainly full with a running time of over 76 minutes. Included is "Give Back the Sun!" or "Return, Sun!" as it's translated here from "Godzilla vs Hedora". Again, this is the Japanese language version. Many people have asked about the English version appearing in the dubbed version of the movie. I have only found a copy of the English version on the Everyone Has A Story: The Songs Of Adryan Russ CD elsewhere on this site and on a CDR sold by Showcase Collectibles at: http://www.godzillatoy.com. There are also several selections here sung by "The Peanuts" who are mostly known from the Mothra movies. I'm one of those people who always enjoy their harmonizing. 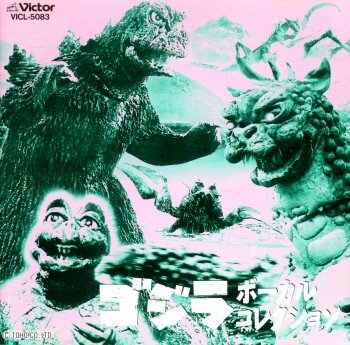 If you enjoy the vocal tracks from the early Godzilla movies, then you'll most likely enjoy this CD. It's a pleasant listen and works well as background music while doing other things.